When I woke up early on Black Friday, I headed not to the mall but to the Lake Apopka Wildlife Drive, to enjoy a quiet morning of nature. It was my first chance to get out with my camera in weeks, and it felt awesome! The sky was blue and clear, the temperatures nice and cool, and the bushes full of birds. The Lust Road entrance to the Lake Apopka Wildlife Drive is more of an afternoon photography spot. The morning light shines on the bushes across the canal, where the birds are farther away than the ones on the driver’s side. I was surprised not to see many ducks in the waters of the canals. 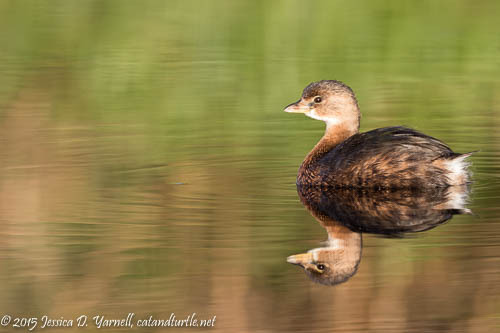 There were plenty of Pied-billed Grebes though, and some of them were very photogenic. Little birds were everywhere! 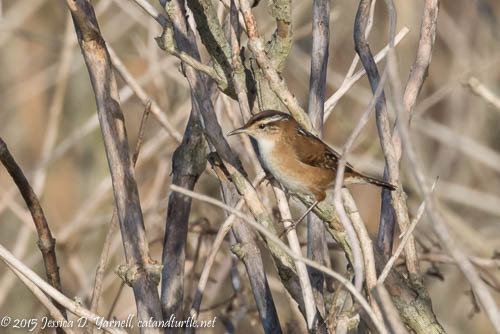 I heard the calls of Marsh Wrens all over the place. A few even hopped out into the open for a quick photo. 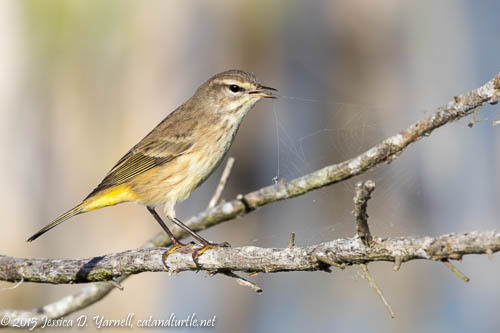 Tiny Palm Warblers bobbled their tails as they hopped from branch to branch. This little guy hopped onto a branch just a few feet away from my camera on its beanbag. 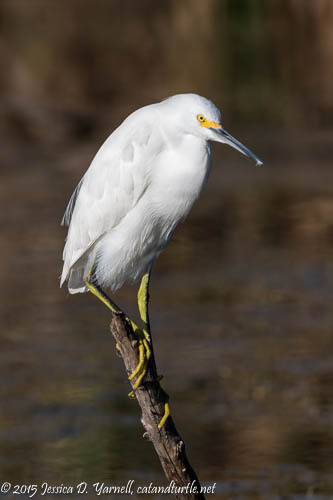 He jumped from branch to branch and grabbed at small insects. When I viewed the image on the computer, I saw that he was plucking a small spider from its web. 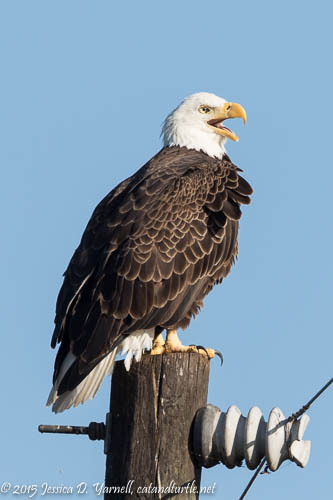 I saw an eagle fly in with a fish to a nearby telephone pole. An Osprey circled near and tried to grab the fish. By the time I got closer, the fish was gone. This isn’t the most natural perch, perhaps, but it’s always fun to see an eagle up close. He gave me a nice yawn for the camera. A few minutes later, I was back in the car driving along as I saw his mate fly in and land for a piggy-back ride. The down side to shooting from the car is that you have to be responsible and stop moving before you leap out with the camera. By the time I got the Beast focused on the action, the mate was flying off. Silly bird! 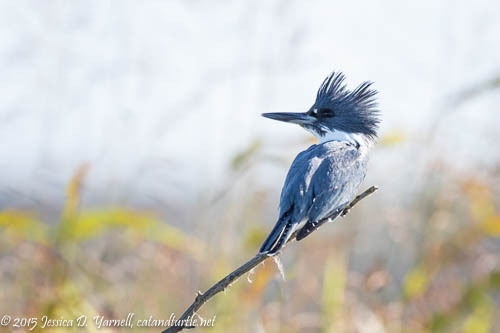 If you want to see Belted Kingfishers, head to the Lake Apopka Wildlife Drive. They were everywhere! Except they weren’t very nice to the poor photographer. As soon as I’d get close, they flew off. They inevitably positioned themselves between me and the sun. 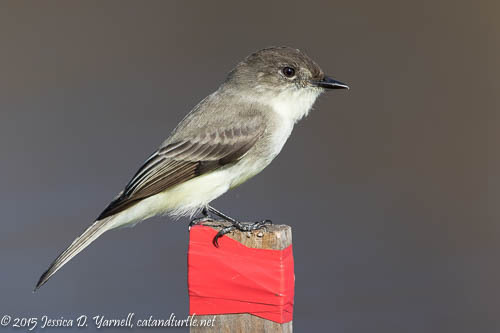 And their favorite perches were the power lines! So I was ecstatic when this guy landed not too far away. At least I had proximity in my favor, even if the silly bird was at a terrible sun angle. Expose +2 EV for the bird, fix the background in Photoshop, and here’s my kingfisher for the day! ⟵First of Fall American Goldfinch! I like the idea of the one-way drive – except for photography from the car! Great images! What a neat place. I must return – soon.